Agents signing Carrier’s Bill of Lading (hereinafter referred to as the “Bill of Lading” or the “Bill”) on behalf of the Carrier by whom the Bill is issued have only the limited authority at common law of masters signing a Bill of Lading. In accepting the Bill of Lading, any local custom or practice to the contrary notwithstanding, any Merchant as defined hereunder agrees to be bound by all stipulations, exceptions and conditions stated herein whether written, printed, stamped or incorporated on the front or reverse side hereof as fully as if they were all signed by such Merchant. referred from this document shall also apply if the transport described on the Bill of Lading is performed by one mode of transport only. “Carrier” means the Company stated on the front of the Bill of Lading as being the Carrier and on whose behalf the Bill of Lading has been signed. “Merchant” includes the shipper, the consignee, the receiver of the Goods, the holder of the Bill of Lading, any person owning or entitled to the possession of the Goods or the Bill of Lading, any person having a present or future interest in the Goods or any person acting on behalf of any of the above mentioned persons. “Container” includes any container, trailer, transportable tank, lift van, flat, flat rack, pallet or any similar article of transport used to consolidate goods. “Shipping Unit” includes freight unit and the term “unit” as used in the Hague Rules and Hague Visby Rules. and the applicable Tariff, the Bill of Lading shall prevail. negotiable and shall constitute title to the Goods and the holder shall be entitled to receive or to transfer the Goods herein described. (2) The Bill of Lading shall be prima facie evidence of the taking in charge by the Carrier of the Goods as herein described. However, proof to the contrary shall not be admissible when the Bill of Lading has been negotiated or transferred for valuable consideration to a third party acting in good faith. (1) The Carrier shall be entitled to sub contract on any terms the whole or any part of the Carriage. person and vessel shall have the benefit of all provisions herein benefiting the Carrier as if such provisions were expressly for his benefit and in entering into this contract the Carrier, to the extent of these provisions, does so not only on his own behalf but also as agent or trustee for such persons and vessels and such persons and vessels shall to this extent be or be deemed to be parties to this contract. (3) The Merchant shall defend, indemnify and hold harmless the Carrier against any claim or liability (and any expense arising therefrom) arising from the Carriage of the Goods insofar as such claim or liability exceeds the Carrier’s liability under the Bill of Lading. (4) The defenses and limits of liability provided for in the Bill of Lading shall apply in any action against the Carrier whether the action be found in Contract or in Tort. provided herein in which case those limitations shall be deemed applicable to Carrier. Article 4 Rule 5 shall be set out as in clause 7 below . damage to the Goods while in its actual or constructive possession before loading or after discharge over ships rail, or if applicable, on the ship’s ramp however caused. contracts on behalf of the Merchant with others for transport, storage, handling or any other services in respect of the Goods prior to loading and subsequent to discharge of the Goods from the vessel without responsibility for any act or omission whatsoever on the part of the Carrier or others and the Carrier may as such agent enter into contracts with others on any terms whatsoever including terms less favorable than the terms in the Bill of Lading. Carrier, then that provision shall apply. exceeding $500.00 per package lawful money of the United States, or in the case of Goods not shipped in packages, per customary freight unit, or the equivalent of that sum in other currency, unless the nature and the value of the Goods has been declared by the Merchant before shipment and inserted on the Bill of Lading and extra freight paid in accordance with subsection (3) below. exceed GBP 100 lawful money of the United Kingdom per package or unit, unless the nature or value of such Goods have been declared by the Merchant before shipment and inserted on the reverse side of the Bill of Lading and extra freight paid in accordance with subsection (3) below. declared value and any partial loss or damage shall be adjusted pro rata on the basis of such declared value. according to the Commodity exchange price, or, if there be no commodity exchange price or current market price, by reference to the normal value of goods of like kind and quality. In any event, compensation shall not, however, exceed USD 2.00 per kilo of Gross Weight of the Goods lost or damaged. 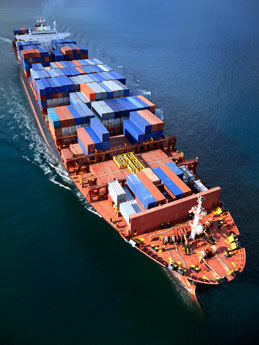 shipping unit provided in any international convention or national law relating to the carriage of Goods by sea. employed in calculating freight charges. As to Goods shipped in bulk, the limitation applicable thereto shall be the limitation provided in such convention or law which may be applicable, and in no event shall anything herein be construed to be a waiver of limitation as to Goods shipped in bulk. oxidation, discoloration or the like did not exist on receipt. delivery thereof under the Bill of Lading or, if the loss or damage is not apparent, within three consecutive days thereafter. convention or law compulsorily applicable, the period prescribed by such convention or law shall then apply but in that circumstance only. Headings are for informational purposes only and shall not be deemed part of the text and shall not be deemed to create, amend or alter any of the terms or conditions herein. themselves or with any third party other than the Carrier and the liberties provided for in clauses 13 and 14 shall be available to the Carrier in the event of any such stoppage. (1) The description and particulars of the Goods set out on the face hereof are furnished by the Merchant and the Merchant warrants to the Carrier that the description and particulars including, but not limited to, of the weight, content, measure, quantity, quality, condition, marks, numbers and value are correct. customs, port and other authorities and shall bear and pay all duties, taxes, fines, imposts, expenses and losses incurred or suffered by reason thereof or by reason of any illegal, incorrect or insufficient marking, numbering or addressing of the Goods. requirements which may be applicable. character of any such articles and so as to comply with all applicable laws, regulations and requirements. If any such articles are delivered to the Carrier without such written consent and marking or if in the opinion of the Carrier the articles are or are liable to become of a dangerous, inflammable or damaging nature, the same may at any time be destroyed, disposed of, abandoned, or rendered harmless without compensation to the Merchant and without prejudice to the Carrier’s right to Charges. person or vessel (other than the Merchant) referred to in 5 (2) above caused by the Merchant or any person acting on his behalf or for which the Merchant is otherwise responsible. (6) The Merchant shall defend, indemnify and hold harmless the Carrier against any loss, damage, claim, liability or expense whatsoever arising from any breach of the provisions of this clause 9 or from any cause in connection with the Goods for which the Carrier is not responsible. received by the Carrier or delivered to the Merchant. Carrier has agreed to seal the Container. damage, claim, liability or expense whatsoever arising from one or more of the matters covered by (A) above. contrary, the Carrier is not under an obligation to provide a Container of any particular type or quality. thermostatic controls have been properly set by the Merchant before receipt of the Goods by the Carrier. If the above requirements are not complied with the Carrier shall not be liable for any loss of or damage to the Goods caused by such noncompliance. reasonable diligence to maintain the refrigerated Container in an efficient state. (A) without notice to the Merchant abandon the Carriage of the Goods and where reasonably possible place the Goods or any part of them at the Merchant’s disposal at any place which the Carrier may deem safe and convenient, whereupon the responsibility of the Carrier in respect of such Goods shall cease. (B) without prejudice to the Carrier’s right subsequently to abandon the Carriage under (A) above, continue the Carriage. animals, Goods of all kinds, dangerous or otherwise contraband, explosives, munitions or warlike stores and sail armed or unarmed. 2) The liberties set out in (1) above may be invoked by the Carrier for any purposes whatsoever whether or not connected with the Carriage of the Goods. Anything done in accordance with (1) above or any delay arising therefrom shall be deemed to be within the contractual Carriage and shall not be a deviation of whatever nature or degree. COGSA or COGWA) to the Bill of Lading. responsibility on the part of the Carrier for loss or damage of whatsoever nature arising during carriage by sea or inland waterway whether caused by unseaworthiness or negligence or any other cause whatsoever. vessel to be delayed or impeded in the prosecution of the Carriage, such live animal may be destroyed and thrown overboard without any liability attaching to the Carrier. The Merchant shall defend, indemnify and hold harmless the Carrier against all and any extra cost incurred for any reason whatsoever in connection with carriage of live animals. hereunder, and thereupon the liability of the Carrier in respect of the Goods or that part thereof shall cease. to post a bond or other guarantee satisfactory to Carrier in an amount determined by Carrier to be adequate as a condition to changing the consignee. Delivery shall be to the consignee or consignee’s agent upon reasonable proof of identity and Carrier shall not be liable absent actual negligence. whatsoever of the Merchant paid or payable to the Merchant by the non-carrying vessel or object or the owner of, charterer of or person responsible for the non-carrying vessel or object and set off, recouped or recovered by such vessel, object or person(s) against the Carrier, the carrying vessel or her owners or charterers. (1) The Carrier may declare General Average which shall be adjustable according to the York/Antwerp Rules of 1994 at any place at the option of the Carrier and the Amended Jason Clause as approved by BIMCO is to be considered as incorporated herein and the Merchant shall provide such security as may be required by the Carrier in this connection. Carrier in respect of any claim (and any expense arising therefrom) of a General Average nature which may be made on the Carrier and shall provide such security as may be required by the Carrier in this connection. (1) Charges shall be deemed fully earned on receipt of the Goods by the Carrier and shall be paid and on returnable in any event. Carrier to be incorrect the Merchant shall pay the Carrier the correct Charges (credit being given for the Charges charged) and the costs incurred by the Carrier in establishing the correct particulars. (3) All Charges shall be paid without any set off, counter claim, deduction or stay of execution. Carrier who has the actual authority of the Carrier so to waive or vary. If any provision in the Bill of Lading is held to be invalid or unenforceable by any court or regulatory or self-regulatory agency or body, such invalidity or unenforceability shall attach only to such provision. The validity of the remaining provisions shall not be affected thereby and the Bill of Lading contract shall be carried out as if such invalid or unenforceable provisions were not contained herein. Shipper’s Letter of Instruction) or via a signed waiver form that may be provided by Merchant at any time prior to Merchant taking possession of its shipment at final destination. The contract evidenced by or contained in the Bill of Lading is governed by the Law of the United States of America and the U.S. District Court for the Southern District of Florida shall be the sole and exclusive forum for any claim or dispute hereunder. Carrier and Merchant acknowledge and agree to waive their respective rights to a jury trial in the event that litigation were to ensue between them arising from, or relating to, this Bill of Lading.